-Applying foundation with a latex sponge makes it easy to see exactly how much you are putting on and aids in blending. Dampen it first, and you end up with slightly more sheer coverage. -Lipsticks are made of 95% wax, and they will go rancid after 3 years. Lip gloss is a better bet, as long as the safety seal is intact and the tube is clear it is most likely safe to use. -Many African-American women have skin that is slightly darker on the forehead than on the rest of the face. Don’t overcompensate by adding extra layers of make-up elsewhere – use two different shades, and be sure to blend well with your clean fingers. 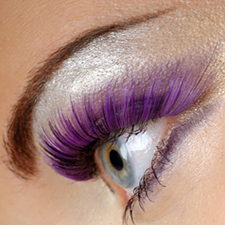 Enhance the beautiful colour of your eyes! -Many lipsticks contain lead as an ingredient. The average woman consumes one stick of lipstick a year. Be sure that your lipstick is lead-free. In search for a treatment to create fuller lashes? Sorry everyone, it is predetermined by your genetic makeup and there really is not anything you can do to change the way they are… but you can change the way that they look! Some women are blessed with long, beautiful and thick eyelashes. Some are stuck with short, sparse and brittle lashes. Fortunately, every year many new products are introduced promising volume and length enhancing properties for our lashes. Curl lashes first! If you curl lashes after applying primer or mascara, they will stick to the curler and fall out. Not such a big deal if you have a lot to lose, but if your lashes are very sparse, even the most subtle loss of lashes is noticeable. Use a primer or clear mascara as a base. Let dry completely before applying mascara. 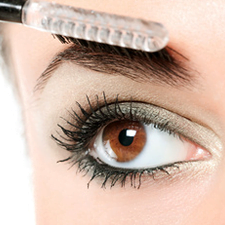 Instead of a lash separator, let mascara dry slightly on brush before applying it to your lashes. This will separate them without using an abrasive tool made of hard plastic. Apply 2-3 coats. There are many culprits which cause puffy eyes, and thankfully many cures. Causes may include heredity, fluid accumulation in the eye area (occurring during sleep), dehydration caused by over-consumption of alcohol, allergies, hormones, etc. Fortunately there are many ways to alleviate unwanted puffiness, and I have the inside tips from several very knowledgeable aestheticians. The trick is applying cold, gentle, and/or caffeinated substances for approximately five minutes to each eye. While cucumber slices are the time-honored favourite, they may cause more irritation than benefit for some. Cooling agents along with caffeine will energize tired eyes. The following two tips have allowed me to look beautifully rested when I felt as though my eyelids were sweeping the floor. Kiran is a highly experienced professional Bridal makeup artist and hair stylist based in Berkshire. She can travel to you at your chosen location on your wedding day and can also cover the Makeup and hair requirements of the bridal party. Kiran also provides makeup and hair services for other special occasion such as Proms, Hen parties and engagement.